Today marks the first day of summer, and you know what that means? Hot days to come and many thirsty lawns! Effective lawn irrigation is essential to fighting off those pesky brown patches from cropping up in your yard. 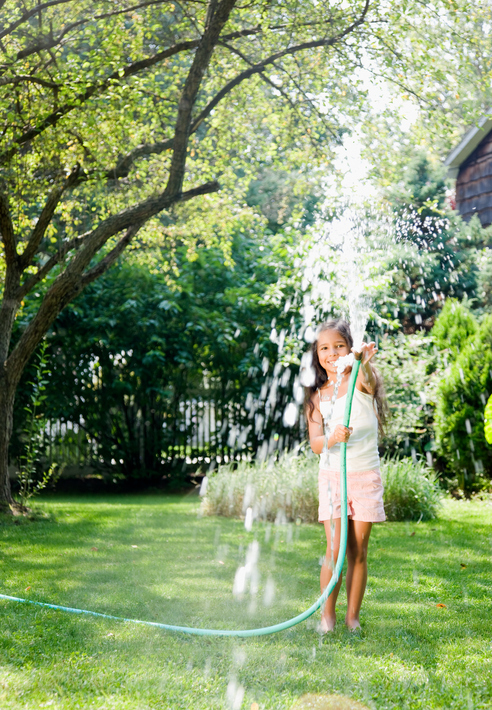 Make sure your lawn stays fresh and lush this summer with these handy lawn watering tips. Your lawn should get about 1 to 1.5 inches of water per week, either from irrigation or rainfall. You can check to see if your lawn is getting enough moisture by probing the soil with a screwdriver. It’s best if water is penetrating at least 6 to 8 inches beneath the soil. A sprinkler will usually take about half an hour to put down ½ an inch of water. How frequently you water will depend on the climate you live in, so it’s a good idea to understand how your location will factor into your lawn irrigation strategy. Also keep in mind that freshly planted lawns are at a key stage during their first year of growth, so getting supplemental irrigation may be necessary to ensuring a healthy, deep root system. 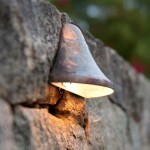 Water conservation is extremely important during the scorching hot summer months. 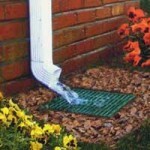 Choose your system carefully to avoid letting a drop of water go to waste. 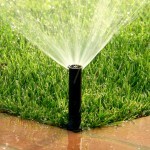 For small lawns you can use a hose-end sprinkler with a timer. In-ground lawn irrigation systems should use low volume, low angle sprinkles that are appropriate for the size of the area you’re watering. 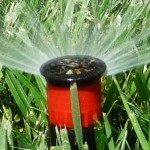 Angle your sprinkler heads as low as possible to avoid evaporation. Observe water distribution to ensure that you aren’t creating puddling or runoff. Fog or mist above your sprinkler is a good indicator of wasteful watering. Adjust water timing and duration in accordance with weather conditions. A smart timer can do this for you on the fly. 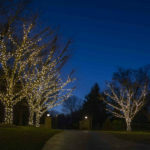 Watering before sunrise will take advantage of calmer winds to help minimize evaporation. Inspect your lawn irrigation system regularly. Leaking sprinklers or water-filled valve boxes are an indication that valves need to be repaired. Your watering schedule should be reset seasonally at the recommendation of your local water authority. This entry was posted on Monday, June 20th, 2016	at 2:43 pm	. You can follow any responses to this entry through the RSS 2.0	feed. Both comments and pings are currently closed.